All our Westward Journey Nickels are in BU(Brilliant Uncirculated) condition. On obverse, big, clipped and left to right Jefferson portrait. 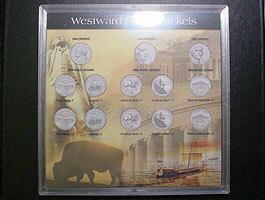 Clear plastic framed holder for Westward Journey Nickel Series. 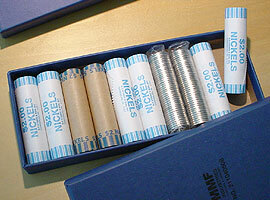 This mini size holder is ideal to make proof coins set(as pictured). 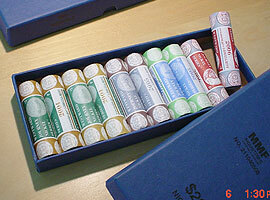 Size: 6 3/4" x 6 3/4"
All US Mint rolls are still in the unopenned white original Mint box. D & P 1 roll ea. This complete set comes with a free matching BU coins complete set(10 coins) and a heavy duty storage box for the rolls, and even free shipping.